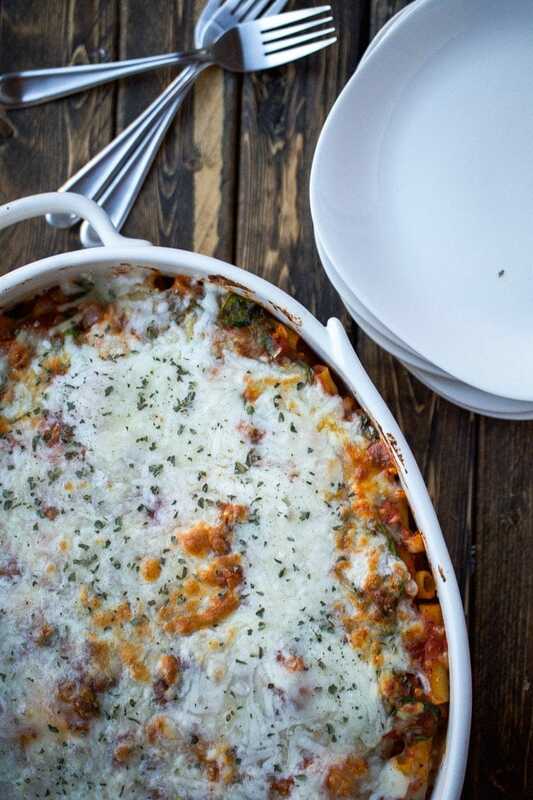 A classic comfort food that is baked with spinach, ziti noodles, pasta sauce, and a variety of cheeses. It’s easy to make and perfect for a crowd. I really like making pasta dishes, and lasagna is one of my favorite pasta dishes to make and eat. The only downfall with lasagna is that it takes a decent amount of time to put together. Time is the reason why I have fallen in love with making baked ziti. 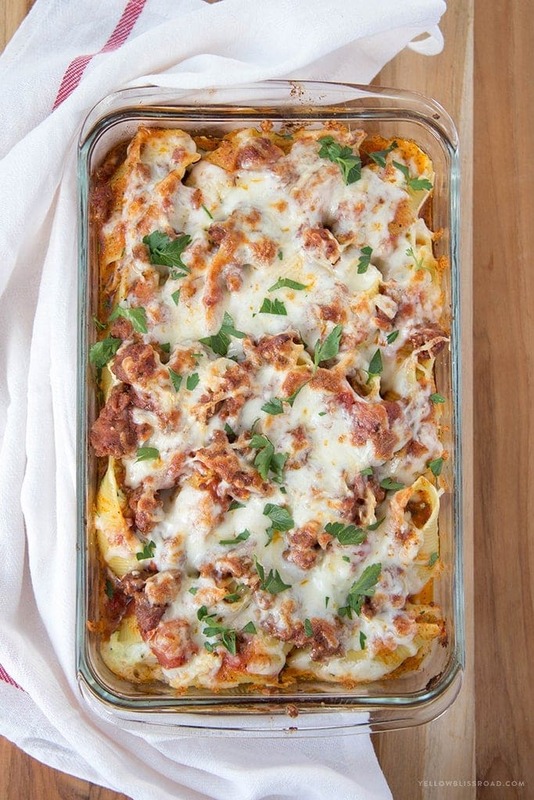 It is very similar to lasagna: there is ricotta, mozzarella, noodles, pasta sauce and other add-ins of your choosing in Baked Ziti, but it comes together in half the amount of time. own Italian dressings and a quick piece of stovetop garlic bread. 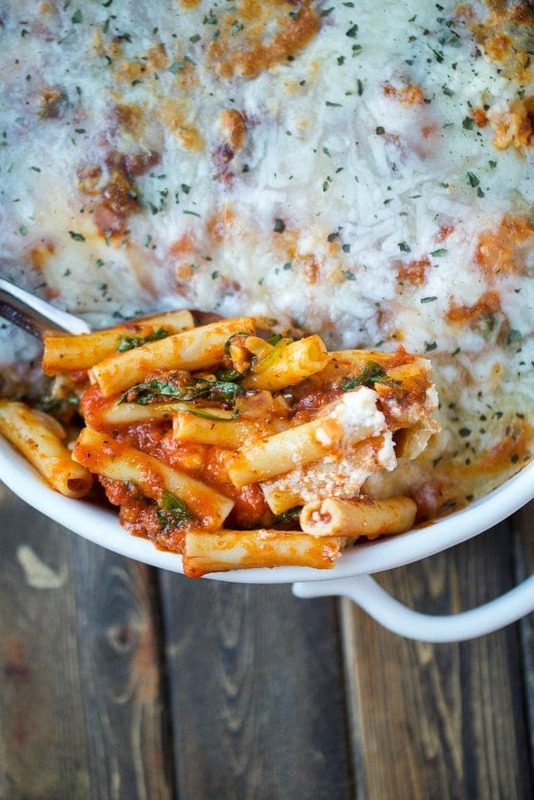 This recipe for baked ziti is a meatless version. I chose to use spinach instead of Italian sausage, bu Italian sausage can easily be added to the pasta sauce. If you are having a hard time finding ziti noodles, you can substitute with penne, rotini, or any shape that is somewhat similar to a ziti noodle. 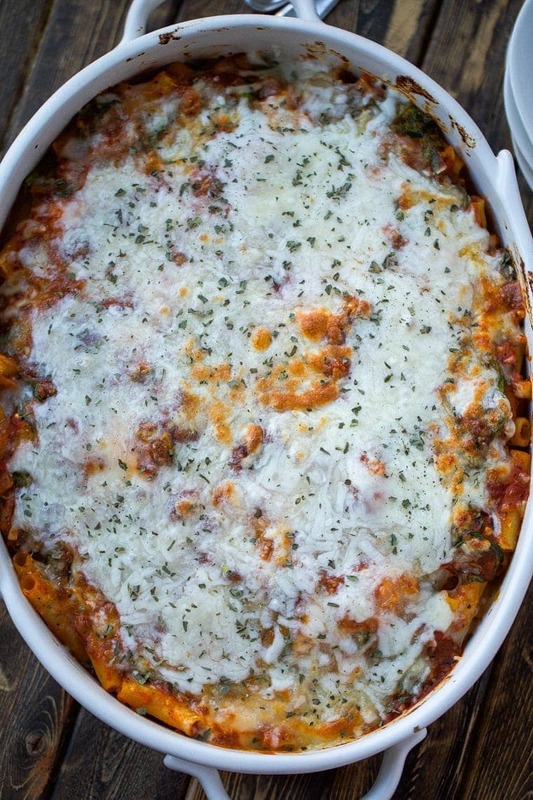 Spinach Baked Ziti Author: Two Sisters Kitchens Cook time: 20 mins Total time: 20 mins Serves: 10 A classic comfort food that is baked with spinach, ziti noodles, pasta sauce, and so many cheeses. It's easy to make and perfect for a crowd. Start by boiling a large pot of water for the noodles and cook noodles according to the package instruction. Toss the noodles with a little olive oil so that the noodles do not stick. 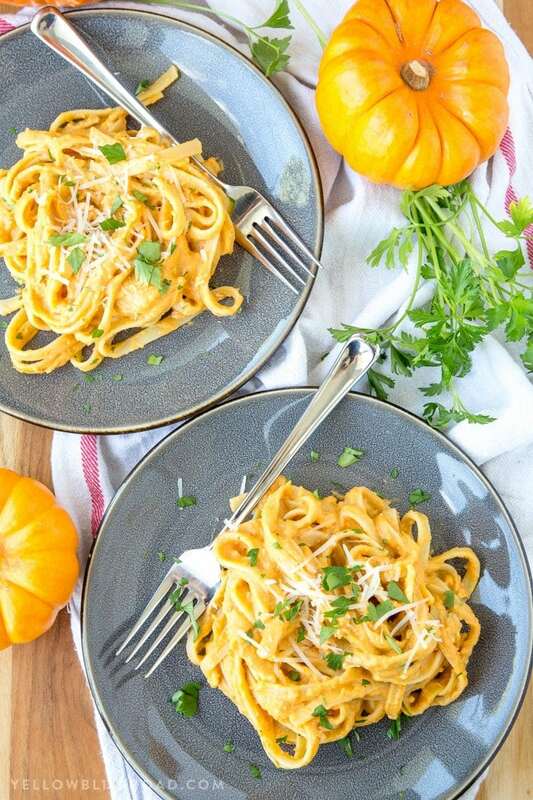 In a large saucepan or large skillet over medium-high heat add 1 tablespoon olive oil and the diced onions, saute for 2 minutes and then add the Italian seasoning, red pepper, and garlic, saute for additional 1 minute. Add the marinara sauce and spinach, stir until everything is incorporated. In a 13by9 in baking dish add a quarter of the spinach pasta sauce to the bottom of the dish, spread over the bottom of the dish. Sprinkle the sauce with 1 cup Mozzarella and half of the ricotta. I did this by dropping 8-10 dollops of ricotta evenly throughout the baking dish. Then pour the noodles into the dish, then add the rest of the ricotta mixture, add again spread evenly as dollops. Then spread the rest of the sauce over the noodles and ricotta. 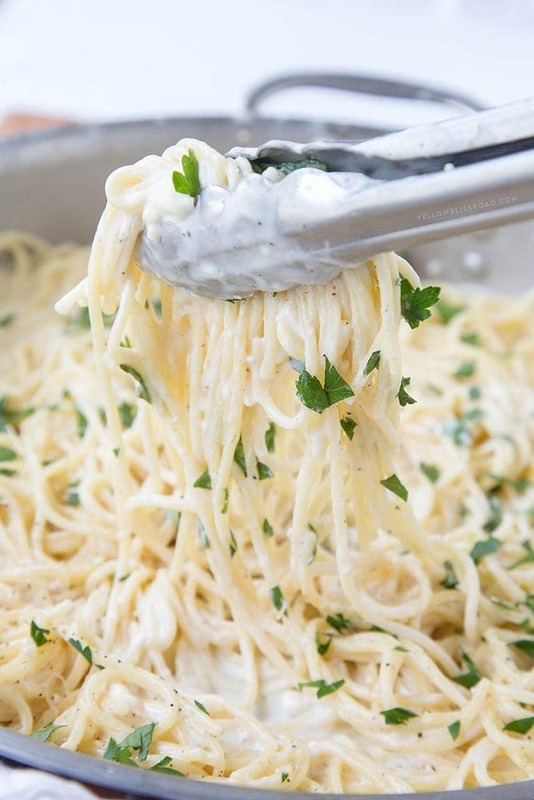 Top with the parmesan cheese and remaining mozzarella. Bake for 20 minutes until lightly brown on top. 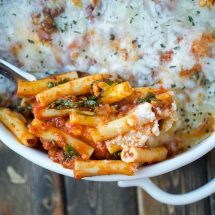 If taking the ziti from out the refrigerator, it might need 30-35 minutes to get hot and bubbly. I would also suggest covering the baking dish with aluminum foil and removing for the last 5 minutes of baking so that it can get slightly brown on top. For all main course entrees go HERE. For the Recipe Index go HERE.